excess, and so continued, night after night, for the rest of the whole season, the song being encored and repeated many times each night, the audience joining in the chorus. 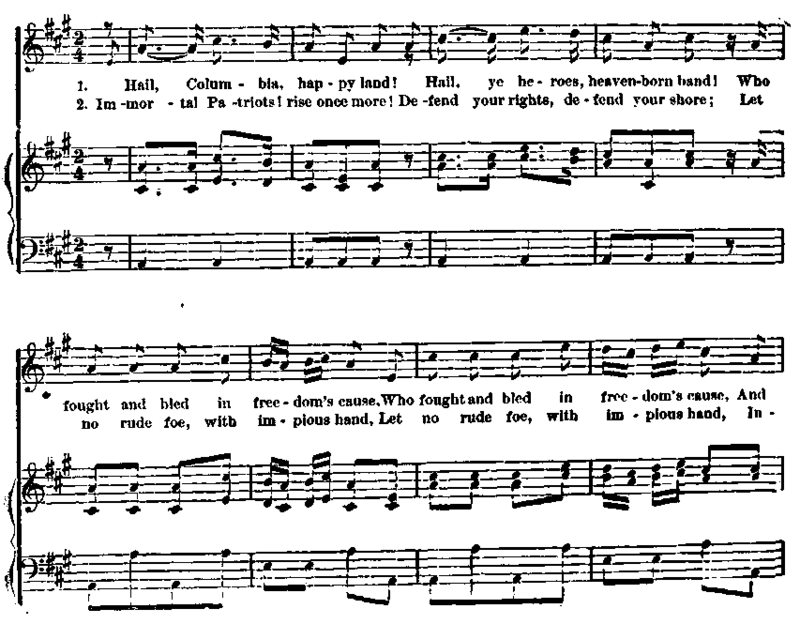 It was also sung at night in the streets by large assemblies of citizens, including members of Congress. The enthusiasm was general, and the song was heard, I may say, in every part of the United States.
" The object of the author was to get up an American spirit, which should be inde�pendent of and above the interests, passions, and policy of both belligerents, and look and feel exclusively for our own honor and rights. Not an allusion is made to either France or England, or the quarrel between them, or to what was the most in fault in their treat�ment of us. Of course the song found favor with both parties�at least, neither could disown the sentiments it inculcated. It was truly American and nothing else, and the patriotic feelings of every American heart responded to it.
" Such is the history of the song, which has endured infinitely beyond any expectation of the author, and beyond any merit it can boast of, except that of being truly and exclusively patriotic in its sentiments and spirit." The music of " Hail, Columbia " was written as a march, and went at first by the name of " General Washington's March." Later it was called " The President's March," and it was played in 1789, when Washington came to New York to be inaugurated. A son of Prof. Phyla of Philadelphia, who was one of the performers, says it was his father's composition. His statement is given by William McKay of Philadelphia. Mr. Custis, the adopted son of Washington, mentions its having been composed in 1789 by a German named Fatles, leader of the orchestra, and musical composer for the old John street theatre, in New York, where he heard it played as a new piece on the occasion of General Washington's first visit at this play-house. The two names (Phyla and Fayles) should, no dOURt, be identical, and the stories do not materially contradict each other.